Looking for a unique classroom valentine decoration? 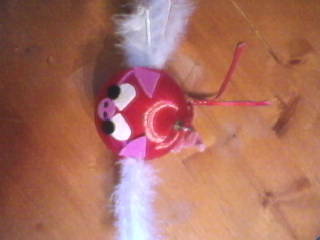 We made a cute pig (or turn it into an Angry Bird) from a recycled satin Christmas bulb ornament. This is an easy and fun Valentine craft for elementary or preschool kids. Enjoy! Hang the craft on a Valentine tree or make a mobile. When Pigs fly... Oink you excited to get started? 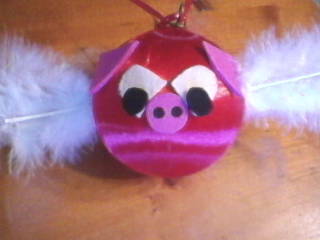 Felt, Foam, Feathers, Pipe-cleaners, Glue, Ribbon, a Straight Pin, and a Satin Christmas Ball Ornament. Note the spiraled pipe-cleaner for his tail. Use the straight pin to 'pre-drill' (punch) holes into the ball where the tail and feathers will go. Add glue to the tip and insert into holes. Cut out eyes, ears, and nose and attach with glue. Tie a ribbon through the hanger. Design your own Valentine Tree with a wire hanger or attach to a back-pack zipper. Attach a note that says, "I'll stop loving you when pigs fly" or "Oink you going to be my valentine?" Lea thanks for stopping by. My kids still chew things. The cat loves this too! I'll stop by your blog later today. Reminds me of "angry birds" :) Totally cute. Thanks for the visit my way early. Can you believe, I've never played! My kids love it. I want to make some Angry Bird Pillows!